Upon your arrival at Darlington Paintball you will be issued with your paintballing equipment for the day. from the gunroom. Now you are ready to play! today. This will add to your total playing experience resulting in a trouble-free day whilst at our venue. Your paintball marker will be maintained by our experienced staff, who will clean it for you between missions. boots) is included in your game fee and there are no 'hidden extras' or costly upgrades to consider. Everyone gets the same equipment, which is of the highest quality. We also have a policy of keeping our equipment meticulously maintained, cleaned and constantly updated for your enjoyment. back to your own starting point whilst protecting your own flag, within a given time limit. attack from the opposing team is declared the winner. and your pilot got out safely. It's a race against time to retrieve the precious cargo inside, but hurry !! dont let it fall into enemy hands or its game over! Your fort is under attack from a seemingly endless stream of enemies. Bedlam Paintball Darlington. The best paintballing deals in Darlington. 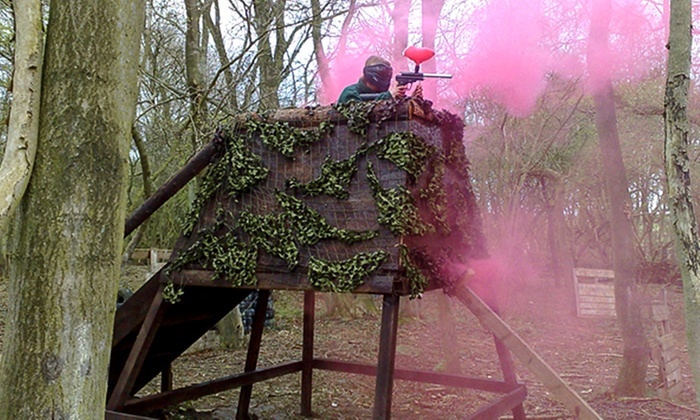 Go Bedlam Paintballing Darlington is a pay as you go package to play paintball in Darlington . The package includes entrance fees, game fees, paintball insurance, paintball marker gun, paintball hopper and propellant for the whole day.